In a medium sized skillet over medium heat, cook chorizo. (Remove from casing first and then break chorizo apart as you cook it). You will need to drain it at least once. It should take about 7 minutes to cook the chorizo. In a large mixing bowl, whisk together the eggs, heavy cream, seasoning, 2 Tablespoons Greek yogurt and hot sauce. (You do not need to add any salt and pepper to your eggs because of the chorizo). Slowly pour egg mixture into skillet with chorizo and scramble the eggs, add cheese. When the eggs are all cooked, spoon mixture into taco shells and top with blender salsa, avocado and queso. 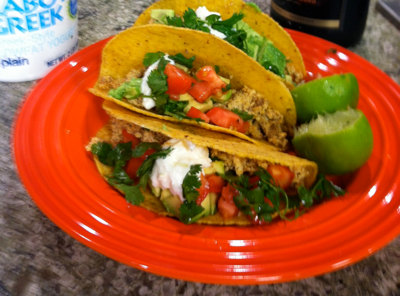 Add a dollop of Greek yogurt to the top, then squeeze lime over each taco before serving. Enjoy!